Swedish christmas ham is an absolute must on every christmas table. Well, maybe not for the vegetarians, but other than that. 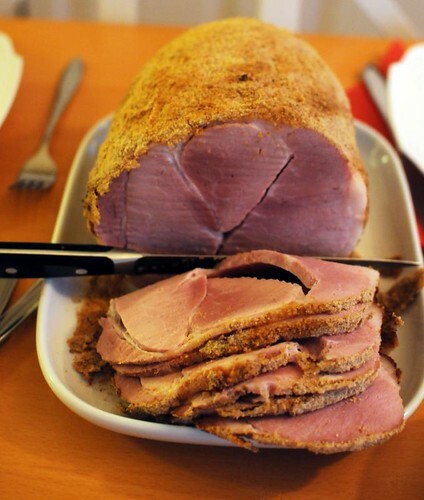 I know families that go through two or three hams during a holiday season, since they eat it sliced on sandwiches every morning - with lots of mustard. Me, I'm not a huge fan, but I do like a slice or two. This year's ham is exceptional. I wrote briefly about the new "canola pig" - rapsgris - a while ago, and I was lucky to get one of very few hams from said pigs. It was indeed superior - very moist and succulent, and flavorful. I sure hope they'll be easy to get next year, because I doubt I can settle for anything less now! So. Get a ham. Either a pre-boiled one, as most seem to do these days (I know I certainly did) or a salted one that you boil or bake yourself. Cut off any visible fat. Or don't. Preheat oven to 225°C. Take three tablespoons of hot, sweet grainy mustard, and one egg. Beat vigorously together until you have a uniform, silky mixture. Brush this over the top of the ham. Sprinkle over breadcrumbs - loads and loads of breadcrumbs - and press them into the mustard. Bake in the oven for fifteen minutes, watch closely so it doesn't burn. That's it! Eat cold, in thin slices. Will keep well in the fridge for quite a while, wrapped in foil. That is one thing I found interesting in the mornings when I ws in Finland, was the "sandwiches" which we have for lunch. Always cucumbers, meat and tomatoes on the table.